There are four War Memorials in the parish. Two are located in the parish churchyard, the 305th Bomb Group memorial on Higham Road and the fourth is inside the Village Hall. 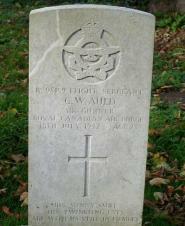 Additionally there is a Commonwealth War Grave Commission maintained grave in the churchyard. 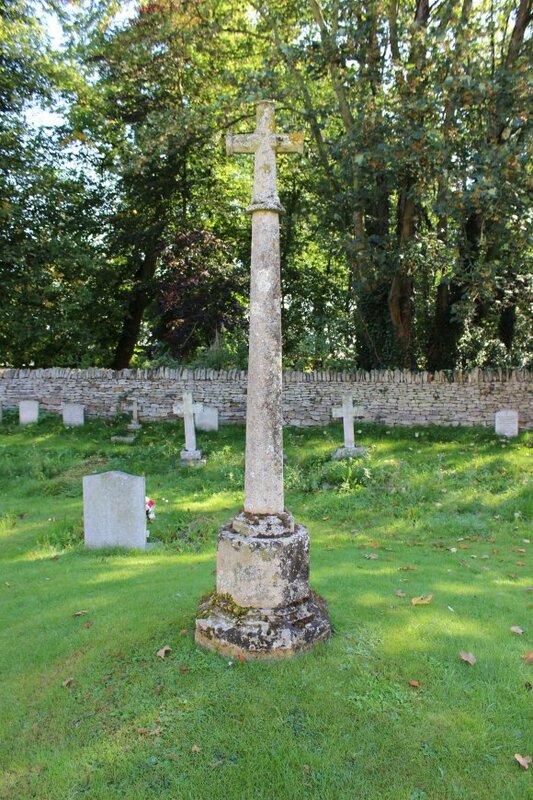 The village war memorial (the Cross of Sorrow) is located to the east of the church and was erected on 19th March 1920. 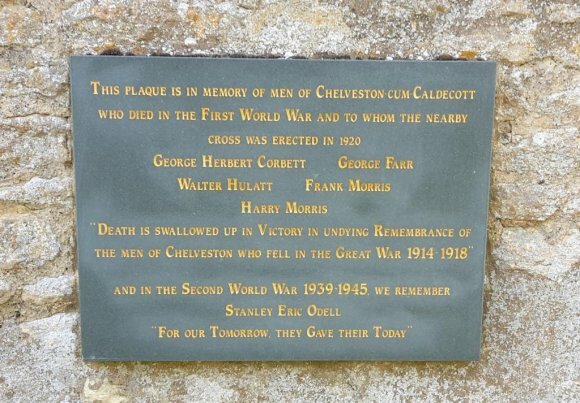 As the original lettering became worn, the Parish Council installed a slate plaque under the east window of the church on 8th May 1996, listing the five villagers from WW1 and one from WW2. The plaque was gilded in 2018 in remembrance of 100 years from the end of WW1. The following provides some background information to the names. Pte George Herbert Corbett (1445 & 14459) served in the 3rd Battalion Coldstream Guards. Son of Joseph & Sarah Corbett, formerly of Hargrave. Joseph Corbett was a beer retailer in Chelveston. George enlisted at Melton Mowbray in July 1915. He served as a Private in the 3rd Battalion, Coldstream Guards (the rank of Guardsman wasn't adopted until 1920) and died on the 15th September 1916 (age 24) during the middle phase of the Battle of the Somme. The 3rd Battalion had moved up to the trenches near Ginchy in early September 1916, and commenced the assault at 6:20 am on the 15th September (the Battle of Flers–Courcelette). Although they captured the initial objectives, they came under heavy machine fire from defenders in a sunken road. 11 officers and 414 other ranks died in the assault. George's body was never recovered and he is listed amongst the missing on the Thiepval Memorial, France. Memorial Panel 7D. Pte George Edward Farr (20032) served in 2nd (Regular) Battalion Northamptonshire Regt. Son of Charles Farr, of Chelveston. George was listed as farm labourer in 1911. George enlisted in Rushden in December 1915 and served in the 2nd (Regular) Battalion, Northants Regiment. Less than 3 months later he was dead (age 22) and is buried at Ration Farm Military Cemetery, France. Plot I grave C.10. Pte Walter Charles Hulatt (200974) served in the 1/4th (Territorial) Battalion Northamptonshire Regt. Lived in Caldecott. He was a shoe worker in Mr Charles Parker's factory at Higham Ferrers. Walter enlisted in Higham Ferrers and served in the 1/4th (Territorial) Battalion, Northants Regiment. He died of wounds on the 28th November 1917 (age 32) from the Battle of Mughar Ridge (part of the Southern Palestine Offensive) and is buried at the Ramleh War Cemetery, Israel. Grave B.72. Gunner Frank Morris (under the name of Charles Burrows). (37364 & 29492) served in the Royal Field Artillery and the 2nd Battalion East Lancashire Regt. Son of Job & Elizabeth Morris, of High Street, Chelveston. In 1901 Frank was listed as a shoe worker. Died 9th April 1918 (age 33). Buried at Premont British Cemetery, Aisne, France. Plot IV Row B Grave 23. Pte Harry Morris (48614) served in the 1st Battalion Royal Fusiliers. Son of Alfred & Emma Morris, of Water Yard, Chelveston. He was employed in the shop of Mr. E. Parsons, High Street, Rushden. He enlisted at Kettering in February 1917 and three months later was in France serving in the 1st Battalion, The Royal Fusiliers (City of London Regiment). Two months later he died (age 19) on the first day of the third Battle of Ypres (Battle of Passchendaele). His body was never recovered and he is listed amongst the missing on the Menin Gate Memorial, Ypres, France. Memorial panel 6. Sgt Stanley Eric Odell (3968060) served in the 4th Battalion Welch Regiment. Son of James Henry & Selena Odell and husband of Betty Odell, of Chelveston. Died 25th February 1945 (age 25). Buried at the Reichswald Forest War Cemetery, Kleve, Nordrhein-Westfalen, Germany. Plot 51 Row H Grave 3. Reichswald Forest War Cemetery - Plot 51 Row H Grave 3.